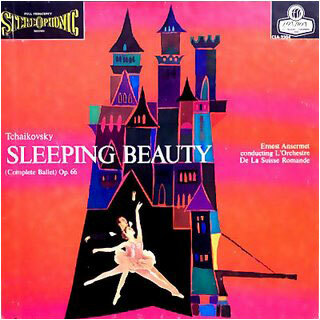 LISTENING NOTES: Beautiful Dreamer: Ansermet's "Sleeping Beauty"
Beautiful Dreamer: Ansermet's "Sleeping Beauty"
This is a magnificent recording, and a classic performance of from the versitile conductor Ernest Ansermet, with L'Orchestre de la Suisse Romande. This is one of Tchaikovsky's finest ballets, and in this three record set, from Decca/London, I don't think I've heard it played better. This is the complete ballet, consisting of 30 numbers, and while the Suite that Tchaikovsky extracted for concert performance is perhaps more engaging to the newcomer, I, for one, would not dismiss a moment of the complete version, particularly this version. My copy is a London issue, pressed by Decca UK for export to the USA. The stampers on all sides end with the letter E. This letter indicates a particular mastering engineer -- Decca used several over the years. 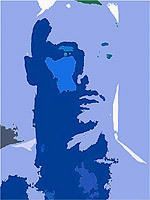 I don't recall the name, but I can tell you his masterings are consistently excellent. Although the box artwork would indicate that these are FFSS wideband label pressings, in fact they are narrowband FFRR label pressings, probably from the mid-seventies. They are uniformly excellent -- flat, whisper quiet, and possess a dynamic range that is staggering! With hardly a noise to obscure low level detail, the famous opening fanfare literally jumps out of the speakers. Even before the first note is played there is a hushed silence where you get a hint of the volume of the hall this was recorded in, which is then more apparent as the decay of these passages fade into silence. It is a startling effect that immediately transports you there. To hear these kind of ambient cues, it is essential to tweak each area of stereophonic playback. Although the best components produce this more vividly, I've found that proper attention to set up can yield results that are similar to a major upgrade. It is essential to look at each step in the reproduction chain starting at the source - a good pressing and careful cartridge set up. An inexpensive but good cartridge will benefit from precise set up. Don't be afraid to do this - once learned you will always be confident that this crucial setting is optimized. Getting an accurate signal from the record is the first step, Bypass this and you will be trying to compensate for the mediocre signal - with different amps, speakers etc. Pay attention to the isolation of the turntable, or vibrations reaching the table will muddy the sound. Clean contacts and connectors monthly. Take the time (if your listening space allows) to set up the speakers properly for stereophonic playback. That usually means away from the walls in an equalateral triangle with your listening position. Tweeter height (and direction) is another factor essential to hear ambient cues. All this may seem a bit overwhelming at first, but try one thing at a time -- maybe one change at each listening session. The benefits far outweigh any inconvenience. For an excellent, easy to understand book on set up, Laura Dearborn's "Good Sound" is recommended. Robert Harley, editor of Stereophile, has written an excellent book "The Guide to High End Audio" which is more recent, and goes into more technical detail. One of my references for orchestral sound is the Reader's Digest Box Set "Festival of Light Classical Music". Although I plan to review the set at a later date, let me just say it has to be the biggest bargain in the used classical record market. Originally priced at $16.95 (four easy payments!) and sold by mail, this magnificent twelve record set, custom pressed by RCA Victor, contains some of the finest recorded sound you'll ever hear. Engineered by Kenneth Wilkinson, these records equal the finest Decca and RCA recordings. What I hear on the Sleeping Beauty set is right up there with my reference cuts from "Festival". For example, a favorite is Saint-Saens' "Dance Macabre", a tone poem full of striking orchestral effects. The hushed plucked strings that follow the jarring violin solo that opens the cut, the menacing subterranean bass that precede the trumpet blasts, the eerie sounds produced bu the xylophone are but a few. The orchestral weight is similar to that on Sleeping Beauty. Listened to at realistic levels, you'll be swept into the illusion. Tchaikovsky utilizes many unusual effects and orchestrations throughout the ballet, making this an engaging listen form beginning to end. I did listen to a another highly regarded version, recorded in 1981, with Antal Dorati conducting the Concertgebouw Orchestra, Amsterdam (Phillips 6769 036). It also features the complete score on three records, which are pressed in Holland. Dorati always has had a way with ballet, as evidenced on his work on Mercury Living Presence (the superb Nutcracker comes to mind). The Phillps release gives us Dorati at his most expressive, with obvious care given to each movement. The Concertgebouw Orchestra plays plays beautifully, fully supporting Dorati's vision for the score. However, the sound, while excellent leaves me feeling that I've missed something. The London/Decca recording lives up to it's pedigree, providing Full Frequency Stereophonic Sound that is simply more involving. It's like viewing a Technicolor film. You know it's not particularly realistic, but it's beauty is such that you don't miss reality all that much. I assume the miking was much simpler on the London/Decca, which might account for the fabulous sense of space and vivid three-dimensional imagery that makes the Phillips seem somewhat bland by comparison. By all means seek out the London/Decca set. The original Decca (wideband) release is very expensive, last seen listed at $275.00! The London pressings are identical (also pressed by Decca UK) and are much more reasonable, around $60.00 or so. The later FFRR (narrowband) pressings are superior and often even less. Highly Recommended!